"For God, Prince, an Faitherland"
Coordinates: 47°08′N 9°33′E﻿ / ﻿47.14°N 9.55°E﻿ / 47.14; 9.55 The Principality o Liechtenstein (German: Fürstentum Liechtenstein) is a sma, laundlockit kintra in central Europe. It haes laund mairches wi Swisserland tae the Wast an wi Austrick tae the east. It haes monie muntains an is a guid place for winter sports. It isna heevily biggit up an haes mony a field an wee ferm giein its laundscape chairacter baith in the North o Unterland an in the Sooth o Oberland. It is the smawest German-speakin kintra in the hale warld. ↑ Raum, Umwelt und Energie Archived 12 October 2011 at the Wayback Machine. 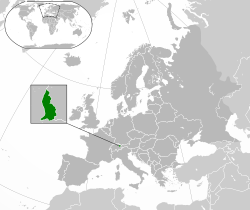 Landesverwaltung Liechtenstein. Retrieved 2 October 2011. ↑ 2.0 2.1 2.2 "Amt für Statistik, Landesverwaltung Liechtenstein". Llv.li. Retrieved 11 May 2018. ↑ "Liechtenstein in Figures: 2016" (PDF). Llv.li. Retrieved 3 August 2017. 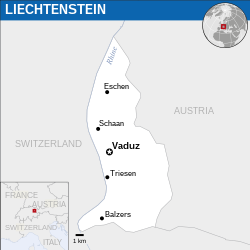 ↑ 4.0 4.1 4.2 Key Figures for Liechtenstein Archived 17 September 2009 at the Wayback Machine. Landesverwaltung Liechtenstein. Retrieved 1 July 2012. ↑ 5.0 5.1 5.2 World Development Indicators, World Bank. Retrieved 1 July 2012. Note: "PPP conversion factor, GDP (LCU per international $)" and "Official exchange rate (LCU per US$, period average)" for Switzerland were used. ↑ "2017 Human Development Report". United Nations Development Programme. 2017. Retrieved 14 September 2018. This page wis last eeditit on 16 Mairch 2019, at 06:57.